Long Meadow Ranch is a brand of Long Meadow Ranch Partners, LP, based in Rutherford, CA. The Ranch is known mostly for its vineyards, winery, and olive groves. But it also raises Highland cattle. 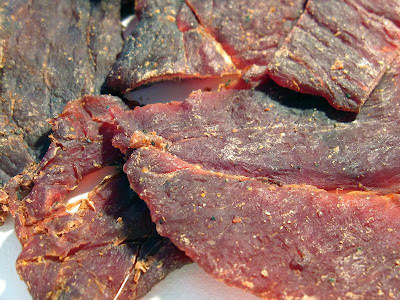 This particular variety of "Cabernet Beef Jerky", is said to be made with cabernet wine. The beef is also made from the same Highland cattle raised on Long Meadow Ranch, which I confirmed with a phone call to them. 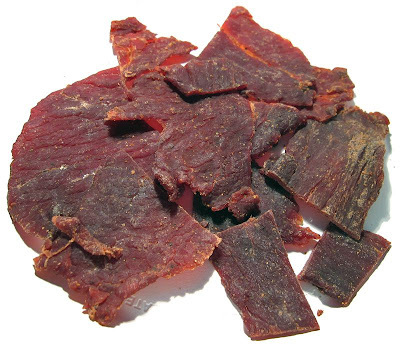 But the jerky itself was manufactured by Intermountain Natural, a meat processor that makes jerky for several brands. The Ranch also claims that this jerky is "All Natural", with no artficial ingredients, and no hormones. It also lists several organic ingredients, but does not carry the USDA Organic symbol. Beef, organic evaporated cane juice, water, cabernet wine, organic soy sauce, organic apple cider vinegar, salt, wine, organic paprika, natural smoke flavoring, organic black pepper, organic onion powder, organic garlic powder. The first thing I taste from the surface of these pieces is a moderately intense sweetness. I can also detect faint traces of onion powder, and faint amount of salt. Overall, a light tasting surface flavor intensity. The chewing flavor starts with a bit more saltiness, and a continuation of the sweet. I can also detect that same faint trace of onion powder. For being dubbed as a "Cabernet Beef Jerky", and made with cabernet wine, I don't taste anything resembling cabernet wine at all. I don't even detect any faint traces of something that could be construed as wine, or even grape-like. If anything, there's a fair amount of sweet in this, but as far as I'm concerned, that's the same sweetness I've found in all the jerky brands manufactured by Intermountain Natural. Otherwise, the flavor that seems to dominate this jerky is that moderately intense, sweetness. It's there on the surface flavor, and in the chewing. There isn't really much else to taste in this. No natural meat flavors to speak of. A light amount of saltiness. A very weak, though barely noticeable onion powder. I can't really detect much smokiness, even though the package says natural smoke flavor was added. Overall, what you're going to taste in this is mostly just some sweetness, and a light bit of saltiness. That's pretty much it. No cabernet wine flavor, or any kind of wine flavor, or grape flavor. This is a dry jerky, with a mostly dry feel on the surface, though some pieces tend to feel semi-moist. I found it easy to tear apart with my fingers, and chewing seems fairly easy. The chewing texture starts out feeling stiff, but a little bit brittle. Just a light amount of biting will make it break apart into small pieces. But with some sucking, it moistens up, and chews down to a soft mass rather quickly. At that point, it tends to feel more crumbly than anything else. I don't really get the sense this has a meat-like, or steak-like feel. Maybe a couple of pieces gave off a resemblance of meat, but still more crumbly than anything. The pieces themselves appear to be quite lean, I didn't notice any visible pieces of fat. Nor did I find any tendon, gristle, and encountered only minimal amount of stringy sinews, or unchewable wads of tissue. It's mostly clean eating, with no residue picking up on my fingers, but I do notice small tiny fragments of meat on my lap. 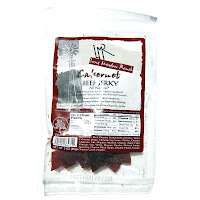 Long Meadow Ranch sells this Cabernet Beef Jerky from its website at a price $5.99 for a 3oz package. I bought two packages. Add to that shipping of $10.00, and it came to a total of $21.98. That works out to a price of $3.66 per ounce. For general jerky snacking purposes, at the $3.66 per ounce price, it's a poor value. I don't really get any snackability from this due to its light, and substandard taste, and the chewing texture was rather uninpressive. The $3.66 per ounce price is very expensive compared to the mass-market jerky brands found in grocery stores, but yet those mass-market brands are either comparable or better than this. As a Cabernet Beef Jerky, being made from cabernet wine, at the same $3.66 price per ounce, it's also a poor value. I don't taste anything at all in this resembling cabernet wine, or any kind of wine, or even grape-like. I think most people will buy this jerky for the "Cabernet" labeling, but yet won't get any cabernet wine flavor. This Cabernet Beef Jerky from Long Meadow Ranch was a good idea that in my opinion missed its mark. Being made with cabernet wine, it sounded like I'd taste some tangy, tart, and fruity flavor mixed into slices of Highland beef. How could you go wrong with that right? Well, I didn't taste any wine at all. All I tasted is some sweet, and a light bit of salt, and that was it for the whole jerky. And it's a little disappointing not being able to taste any natural meat flavors considering this was made from Highland Cattle. Highland Cattle is said to be the most prized of all the beef breeds, yet I couldn't taste any beef at all. I wasn't able to get myself interested in this jerky due to its light flavor limited to just sweet and salt, and it's rather unimpressive chewing texture, feeling mostly crumbly. If anything, the best I can say for this jerky is that it was easy to eat. Overall, it's not a bad jerky, it's just unimpressive. Interesting idea creating beef jerky with wine. Your site is rather original to me as well as I can't recall ever seeing a wide range of beef jerky tastings before.